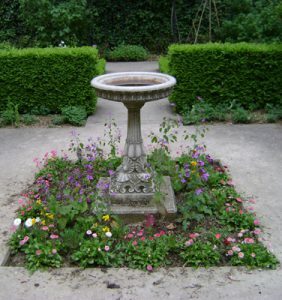 One of Paris’s most delightful parks—the Close des Blancs-Manteaux in the Marais–is definitely one of the City of Light’s most hidden treasures. I stumbled across Clos des Blancs-Manteaux by complete accident. And that’s entirely because I was in the right place at precisely the right time. Why is timing so important? Because this lush three-tiered park is open only on weekends due to its location in a courtyard shared with an adjacent preschool. On school days, the courtyard—and hence the garden—is strictly off limits. Even on weekends the green space is terribly hard to locate. Access to the park is through a stone archway next to the preschool and then down a long stone corridor that spills out onto the garden (a small part of which is fenced off for the preschool’s playground). From the street, it’s nearly impossible to tell that there’s a park just 10 yards away, even when peering through the archway entrance. The only street signage for Clos des Blancs-Manteaux, and it’s displayed only on weekends when the garden is open. There’s also no permanent signage for the park: The only indication of its existence and when it is open to the public is a water-can-shaped sign placed on the sidewalk in front of the archway during opening hours. When the park is closed, the sign is folded up and moved inside. Fortunately, I was exploring the Rue des Blancs-Manteaux (so-named for the white habits—called blancs manteaux in French—worn by the inhabitants of a friary founded on the street in 1258) on a Saturday afternoon when I noticed the water-can sign. 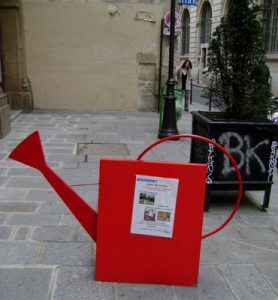 Since I’d never seen it before during my other jaunts up and down the Rue, my curiosity was definitely piqued. So I stepped inside. 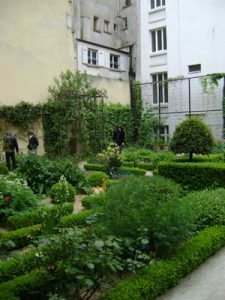 The three-level garden is one of the best places to take a respite from the traffic and crowds of the Marais, and is surprisingly hushed for being so close to a busy thoroughfare. As one might expect from its hidden nature, the park also is rarely crowded. In fact, during my three separate visits (yes, I loved the park so much I’ve been back two more time) I once had the park entirely to myself for a full half hour. During the other two stops, there were only a handful of additional visitors. The first two levels of the park are filled with tall trees (with plenty of benches under which to sit and enjoy) that provide much-needed shade in the summer and a cacophony of color in the fall. The highest level is overflowing with row upon row of flowers, shrubs, fruits, vegetables and herbs. Clos des Blancs-Manteaux is not as carefully planned and groomed as other green spaces in the Marais, particularly the more formal Place des Vosges or nearby Saint Gilles-Grand Veneur Garden. 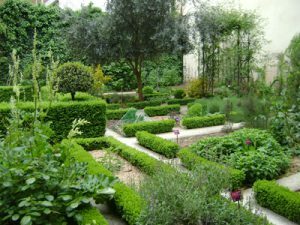 But its more “wild” ambiance and the fact that its hidden nature makes visitors feel like they’re in-the-know on a deeply held Parisian secret makes Clos des Blancs-Manteaux most worthy of a special weekend trip. 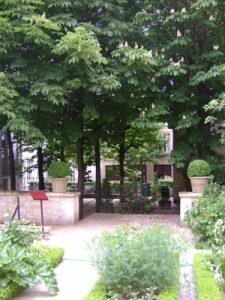 This entry was posted in Hidden Paris, Marais, Parks and Squares, Right Bank, Walking in Paris and tagged Clos des Blancs-Manteaux, Place des Vosges, Saint Gilles-Grand Veneur Garden by Bob Adams. Bookmark the permalink.